Here are just a couple of views at one distinctive pitching statistic we don't often talk about but is pretty telling. Tonight, we are going to look at two leaderboards for the percentage of swings and misses inside the strike zone (from fangraphs). Personally, I think it's pretty awesome if a pitcher can throw a pitch for a strike and hitters still can't hit it. What is that, a gang sign? 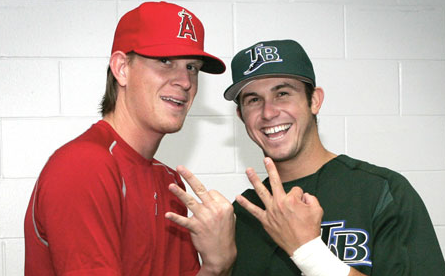 I knew Jered Weaver had an outstanding season last year, but wow. He's way ahead of the rest of the league. As if the Phillies fabulous rotation needed any more publicity, how about the fact that the supposed #3 and #4 starters on that team are actually in this Top 10 leaderboard, while Roy Halladay and Cliff Lee are not. Is anyone else feeling 106 Wins for next year's Phillies. Is that too many to predict? Whatever it is, I think I'm going with the Over. Shaun Marcum also makes a nice, unexpected appearance on this leaderboard. The Brewers with a 1-2-3 of Gallardo, Greinke, and Marcum are definitely going to finish ahead of the Cubs, and probably even the Cardinals. The Reds, Brewers, and Cardinals all look better than the Cubs. I'd actually rather have the Pirates' 40-man roster right now, than the Cubs. The Astros have problems and a lot of youthful exuberance, but they are not looking much better than the lovable losers from Wrigley Field. Where did it all go wrong, guys? The Pirates don't have much pitching, at all, and it's all about pitching. But, if they get lucky somewhere, find a couple of arms in the low minors that can help the Major League club, they could win games the way they should score runs. Basically, it's going to be a rough season for Cubs fans. I want to be in a rotisserie league where someone named Ernesto Frieri is relevant. 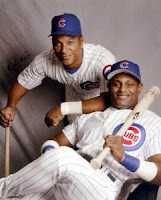 It's as solid a name I've seen since Amaury Telemaco and Heathcliff Slocumb were around. Micah, sign with the Cubs. How about that Micah Owings, huh? Go Tulane! And, Micah Owings is still a free agent? Maybe I should represent him. I'd only take 3/5th's commission, since we're both Tulane Alums. 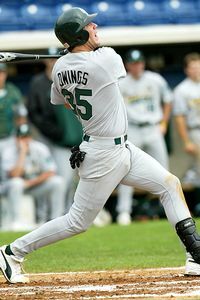 If we may foreshadow another post that should be up in a few days, Micah Owings can also hit well enough to add to his expected run support. Octavio Dotel and Takashi Saito are free agents, as well. I guess I'd rep them for 3/5th's commish, too. What the heck. Rafael Betancourt justified the first season of the big 4-year contract he got from the Rockies. I recall, at the time, I was one of the few who appreciated that move by the Rockies. It is still likely that during the 3rd or 4th year of the deal, it will be regrettable. Very few three and four-year deals to set-up relieves have been worthwhile for the teams cutting the checks. As Ron Artest likes to say, big ups to a few guys who just missed out on the starting pitcher Top 10. Studs, Lincecum, Liriano, and Verlander were ranked 11th, 12th, and 13th, respectively. I was really surprised by Kyle Davies tied with the outstanding Mat Latos for 17th (13.6%). Randy Wells placed 22nd (13.1%), one click ahead of Phil Hughes and Mr. Fastball Ubaldo Jimenez at 13.0%. Instead of honrable mention, we will send a big hearty Mazel Tov to the 11th and 12th placed pitchers in the 30 IP minimum group, Hong-Chih Kuo and Jeremy Hellickson. 6th starter, he'll be on our roto team. 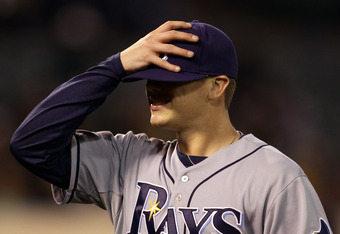 Don't sleep on Hellickson, he will be starting for the Rays next season and helping fantasy teams along the way. I hope the Rays do not trade a starter until after the season starts, so that Hellickson could possibly fly enough under the radar to make it on our team when we take pitchers in rounds 12's and teens. To bring this somehow, miraculously, relatively full circle, Jered Weaver placed 13th in all of baseball with just a 30 IP minimum. It is outstanding for anyone, remarkable for a starter, and extremely impressive that Hellickson finished right ahead of him. While his stint in the big leagues last season was certainly a small sample size, Jeremy Hellickson compiled his positive statistics in his starts, not relief appearances. If you want to have some fun with numbers, check out the full statistical leaderboards on Fangraphs. What we've been looking at tonight is in the "Plate Discipline" tab for pitchers. We can do more quick posts like this if y'all like them. Feel free to suggest other stats or in-game occurrences you'd like us to jump into. Thanks again for reading. Happy Festivus.